Cover of the catalogue, 1923. The New Art Exhibition [Wystawa Nowej Sztuki] was held on 20 May - 20 June 1923 at Corso Cinema [Kinematograf Corso] on A. Mickiewicz Avenue in Vilnius [Wilno] and organised by Władysław Strzemiński and Vytautas Kairiūkštis. One of the first manifestations of constructivist art outside Russia. Works included painting, drawing, sculpture, architecture, scenography, and prints. Cubist, Constructivist, and Suprematist compositions predominated. Its catalogue includes Kairiūkštis’ constructivist manifesto. 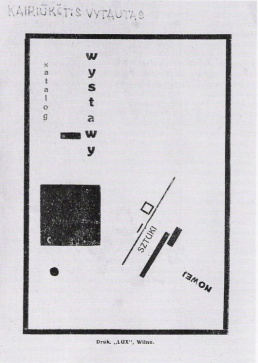 The exhibition marked the first appearance of Polish Constructivism; besides Strzemiński and Kairiūkštis participants also included Mieczysław Szczuka (first montage photographs), Henryk Stażewski, Teresa Żarnowerówna, Karol Kryński, and Maria Puciatycka, all of whom later become the members of the Blok group. 70th Anniversary Exhibition, Muzeum Sztuki, Łódź, 1993. Catalogue. This page was last modified on 4 August 2015, at 01:24. This page has been accessed 6,972 times.